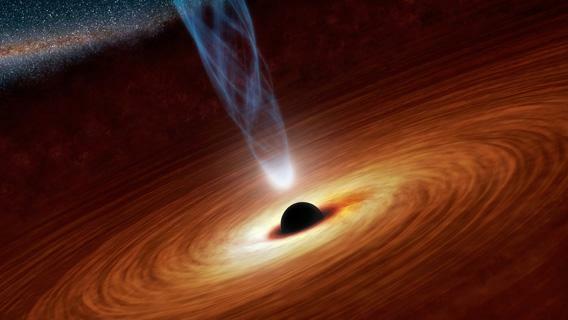 Symphony of Science: Black Holes. Black holes can gobble down matter and spew out vast beams of matter, focused by intense magnetic fields. Click to ergospherenate. Black holes are intrinsically cool. 1) In the center of every big galaxy lies a supermassive black hole. Our Milky Way has one, four million times more massive than our Sun. 2) Not only that, but there are tens of millions or possibly billions of smaller black holes wandering the galaxy! Never fear, though: The odds of one getting close enough to Earth to do us any harm are so small that the Universe could be a thousand times its current age, a million times, and we’d still never get close to one. But just knowing they’re out there…yikes. And see? That’s cool. There’s something fascinating and forbidding and compelling about black holes. They’re weird, they defy our everyday logic, they’re the ultimate endpoints of matter. You’ll see a lot of familiar faces in there. I was pleased to see my old friend Brian McNamara (in the blue shirt, first appearing at the 1:38 mark) there, too. We were in grad school together at UVa, and that video is (I believe) actually from a PBS show called “Monster of the Milky Way”, which I worked on a bit a few years back (the show was funded in part by a NASA mission I was involved with). So that was fun to see him again. I’m a big fan of the Symphony of Science series, too. Heck, I’m in one. But they’re all pretty good, and well worth your time to watch. You can find them all on melodysheep’s YouTube channel. And if you want to learn more about black holes, here’s something for you: an article I wrote called Ten Things You Don’t Know About Black Holes. How many did you not know?